On Dec. 14, the city of La Mesa announced that applications are being accepted for its Community Relations and Veterans Commission senior representative. The city is looking for an appointee who is a resident elector of the city of La Mesa and is not less than 55 years old at the time of the appointment. The senior representative on the Community Relations and Veterans Commission works with other community volunteers to address the needs and concerns of senior adults, the disabled, veterans, and the community-at-large, and develop activities that promote positive community relations in the city of La Mesa. Commission meetings are held on the fourth Wednesday of each month at 5:30 p.m. in the La Mesa Adult Enrichment Center, located at 8450 La Mesa Blvd. Applications are available on the city’s website, cityoflamesa.com, or at La Mesa City Hall, 8130 Allison Ave., during normal business hours. For more information, call the Office of the City Clerk at 619-667-1120 or visit the city’s website. USE Credit Union has relocated its La Mesa branch to a new shopping plaza at 8216 Parkway Drive in the heart of La Mesa. The new branch opened Oct. 16 and serves La Mesa and surrounding neighborhoods. Before the move, the credit union has served the La Mesa community for over 16 years at another location. The look and feel of the new branch reflects the latest concepts in branch design. USE Credit Union’s La Mesa branch replaces a long-standing fixture — the teller line — in favor of more employees with mobile tablets welcoming members as they enter the branch. State-of-the-art self-service teller machines supplement a full complement of associates who are available for more in-depth conversations on a range of banking services, including buying a car, purchasing or remodeling a home, consolidating bills, and more. USE Credit Union’s new branch is a reflection of the digital-first economy that allows consumers to complete many banking transactions on their own. The credit union features open-concept architecture, multiple comfort areas, community tables, booth-style seating, and several offices for more privacy. The branch also features a private community room that can be reserved by nonprofits and other community groups. Universal bankers roam the branch with tablets capable of conducting a variety of transactions. 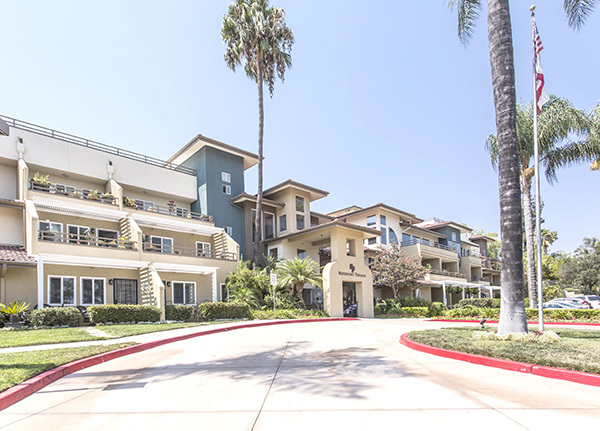 Waterford Terrace Retirement Community, an all-inclusive independent living senior retirement community in La Mesa, located at 5580 Aztec Drive, has received the 2018 Best of Senior Living Award from SeniorAdvisor.com, the largest ratings and reviews site for senior care and services in the United States and Canada. The award recognizes the best of the best of in-home care, assisted living and other senior living providers based on the online reviews written by seniors and their families. Now in its fifth year, the awards program tabulates over 150,000 reviews to identify the highest quality care providers. To qualify for the award, care providers must have maintained an average overall rating of at least 4.5 stars while receiving four or more new reviews in 2017. Of the nearly 45,000 communities listed on SeniorAdvisor.com, just over 1,600 received the award. “The Best of Senior Living award is especially meaningful as it represents real world, honest feedback from our valued residents and their families,” Luis Serrano, CEO of Sunshine Retirement Living, said in a press release. Sunshine Retirement Living is the management company for Waterford Terrace. 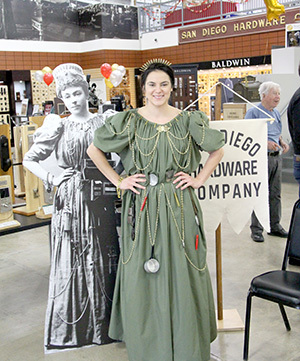 Leading up to the anniversary, San Diego Hardware conducted a search for the identity of the original “Hardware Lady” that appeared in the store’s advertisements. With the help of the public, the owners learned the woman was Fanny Sherman Sloane from a pioneering San Diego family. At the celebration event, La Mesa resident and model Kelly Zive posed for photos in a gown identical to the one in the photo. The gown will remain on display in the store. Fanny Sherman Sloane, according to our sources, was born in 1871 and was the daughter of Capt. Matthew Sherman and Augusta Barrett, both prominent citizens. Capt. Sherman was mayor of San Diego from 1891 to 1893. Sloane was in her early 20s when she posed for the photograph and no doubt, her father knew the original founders of the company: Fred Gazlay, John M. Wood, George M. Hawley and George T. Hawley, who purchased the retail store of Todd & Hawley, 658 Fifth St., and changed the name to San Diego Hardware & Company. Current co-owner Bill Haynsworth is the great nephew of Fred Gazlay. Bill Haynsworth bought the business, together with co-owner Rip Fleming, in 1983 from Haynsworth’s father. Haynsworth’s son Bryan currently works at the store, making him the fifth generation to help with the business. Daughter of store co-owner Rip Fleming, Hannah Fleming, also works at the store as marketing manager. Over the years, the store sold many different items from pots and pans to Winchester rifles, cast-iron stoves and iceboxes until Haynsworth and Fleming focused their core products on decorative hardware. 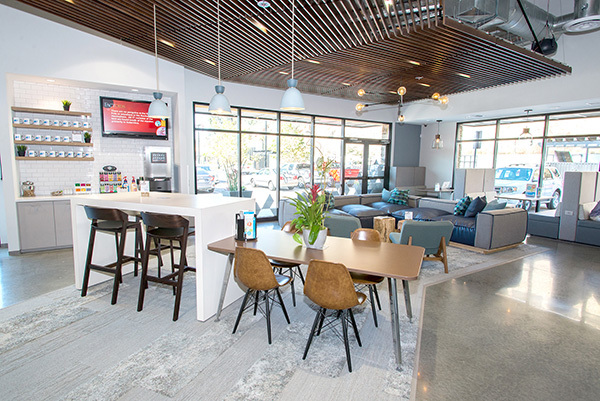 Located in Downtown San Diego for more than a century, the company moved in 2006 to Kearny Mesa to better serve its customers with a larger space, freeway access and convenient parking.